Water when the mix just approaches dryness. This will mean about every 5-7 days. A way to check the mix for moisture is by sticking a wooden pencil into the mix about 3''-4''. When you pull the pencil out, check the wooden end. If it has turned dark in color, the mix is still wet and you should wait a day or two. Oncidiums prefer clean water without a lot of mineral content. Therefore growing best when you use distilled, reverse osmosis or rainwater. Check out our Kent Marine page for more information on reverse osmosis systems. Do not use softened water. For tap or well water, fertilize with Grow More Urea Free 20-10-20, at the rate of 1/2 tsp. per gallon. Feed every other watering during the summer, and every third watering in winter. Grow in bright diffused light; east or west windows are ideal. South windows will work but one should be careful of the brilliant sun that will come in during the fall through spring months. If you have miniblinds or sheer curtains, you can break the light so that it is more diffused. One of the best types of artificial light you can provide for your orchids is by using L.E.D. Grow Lights. Be sure to check out our L.E.D. Grow Lights page for more information. Ideal night temperatures (fall, winter, and spring months) are 60°-64° Fahrenheit. Ideal daytime temperatures are 70°-85°F. Summer temperatures are generally a few degrees warmer. Humidity levels for these plants should be kept at 40% or above. Depending on the variety the flowering season can be at any time of year, but is generally heaviest in the fall and spring. Many hybrids can bloom 2-3 times per year. In order to initiate the flower spikes, it is important to grow the plant in an area where the night temperatures fall below 65°. Usually plants growing by a window are a couple of degrees cooler than the rest of the house. The flower spikes on Oncidiums generally grow to a medium or tall length and branch out in several directions. Keep a close eye on the spike (when it begins to produce flower buds) for aphids. Oncidiums are one of the most favored orchids of the aphid bug. Repot every 1 to 2 years as the mix breaks down or as the plant outgrows the pot. Plants potted in a bark mixture should be carefully pulled out of the pot. Clean off the roots of the old mix, being careful not to break the good roots. However, breaking roots when repotting is inevitable. Roots that are bad and should be cut off are those that are brown and mushy or papery. Those roots that are white or tan and are firm to the touch should be left alone. Simply place the plant into a new pot, placing the oldest growth towards the back of the pot so there is room for the newer growths to develop for about 1-2 years. Oncidiums can be divided when there are 6 or more pseudobulbs. Divide, leaving 3 growths per each division. 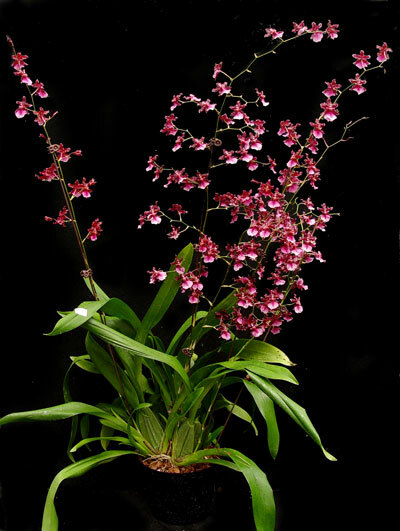 Generally Oncidiums are planted in either an orchid bark mix or New Zealand sphagnum moss mixed with tree fern fiber.